​To make the porcini gnocchi, preheat oven to 180°C (350°F). Place the potatoes on a baking tray filled with rock salt and bake for 1 hour or until soft and skins are crispy. Allow to cool slightly. Cut in half, scoop the flesh into a bowl and mash until smooth. Place the porcini mushrooms in a bowl with 2 cups (500ml) boiling water. Set aside for 5 minutes. Drain well, reserving ¼ cup (60ml) liquid. Finely chop the porcini and add to the potato with the parmesan, flour, salt and pepper and mix to combine. Add the egg yolks and stir until mixture just comes together. Turn out onto a lightly floured surface and knead for 1 minute or until a soft dough forms. Divide into 2 equal portions and roll each piece into a 64cm-long rope. Cut into 2cm-long pieces and place on a lightly floured tray. Set aside. Heat 2 tablespoons olive oil in a large frying pan over medium heat. Add the sage and cook for 1–2 minutes or until crispy. Drain on absorbent paper and set aside Add the remaining oil to the pan with the garlic and Swiss brown mushrooms and cook, stirring occasionally, for 5–6 minutes. 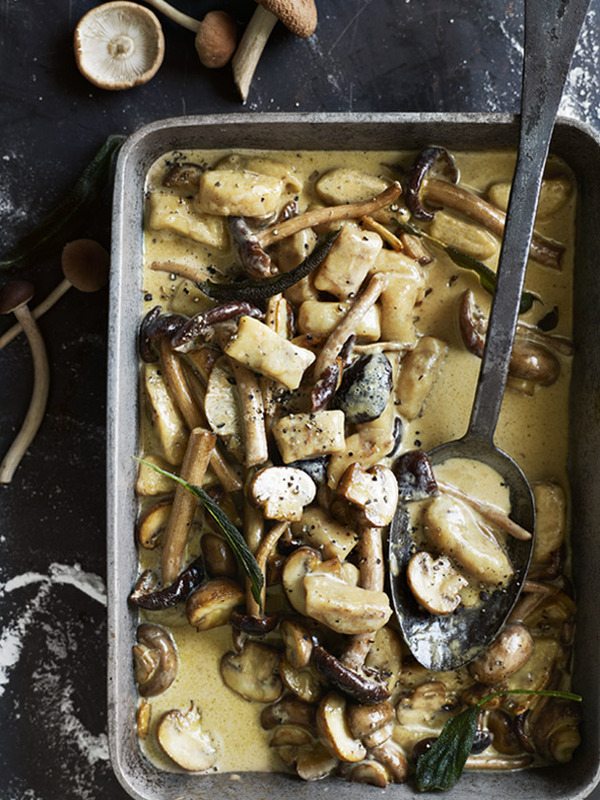 Add the chestnut mushrooms, salt and pepper and cook for a further 3–4 minutes. Add the cream and reserved porcini liquid. Bring to the boil and cook for 3–4 minutes or until slightly reduced. Cook the gnocchi, in batches, in a large saucepan of salted boiling water for 3–4 minutes or until firm and floating to the surface. Remove with a slotted spoon. Add the gnocchi to the sauce, mix gently to combine and top with the sage leaves to save. Serves 4.